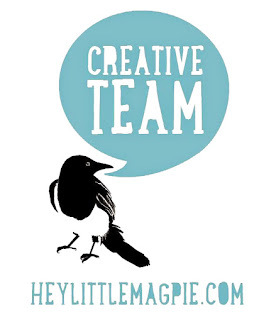 Hi and Christmas Cheer to all the UKS hoppers who are visiting my little project today! 1. 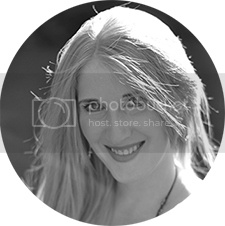 Visit the UKS Home Page every morning where you'll find a new project -click the link to get the tutorial. 2. Comment on the blog thread. If the project is not on a blog, you get a PASS. 3. YOU NEED ONLY COMMENT IN THE UKS THREAD AFTER the 23rd of December, and if you have commented on all the blogs. We will compare the commenters in the UKS thread to the blog comments after the 25th and announce the winner on New Year's Eve. My version doesn't quite have as much body and isn't as well photographed but I'm pleased with how it turned out nonetheless. various scraps of card, star shaped punches (or other shapes of your choice), non-permanent adhesive (if you haven't got this then don't worry, there's a bit about that below), a sewing machine and a few other minor bits and pieces that I'll tell you about on the way. Punch a load of stars in different colours and sizes. Grab a piece of regular copy paper (the thinner the better) and run a strip of non-permanent adhesive down it. Stick your star shapes to it. If you don't have non-permanent adhesive, then use regular adhesive or double sided tape, then 'blot' it with your fingers/hand/leg/arm etc so that it loses some of it's sticky. 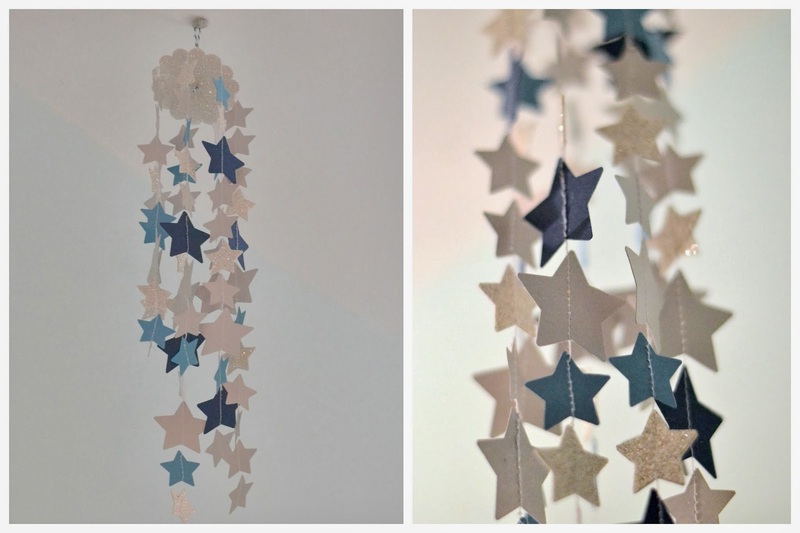 We really just need to tack the stars in place so as long as it's sticky enough to keep the stars in place for a short time, you're good to go. 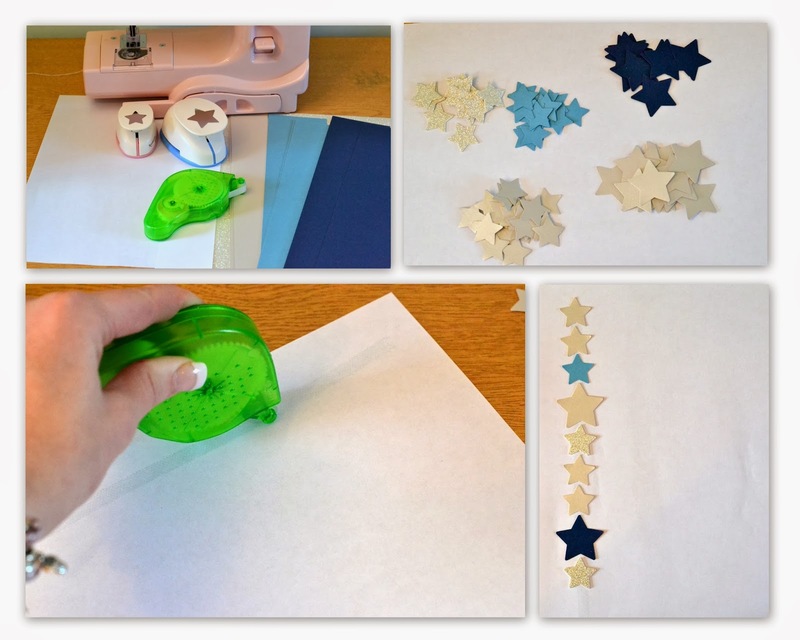 Once your stars are tacked onto the copy paper, run them through your sewing machine. I've used white thread. Leave both ends quite long. NOTE: the stars will be sewn to the paper - that is correct! 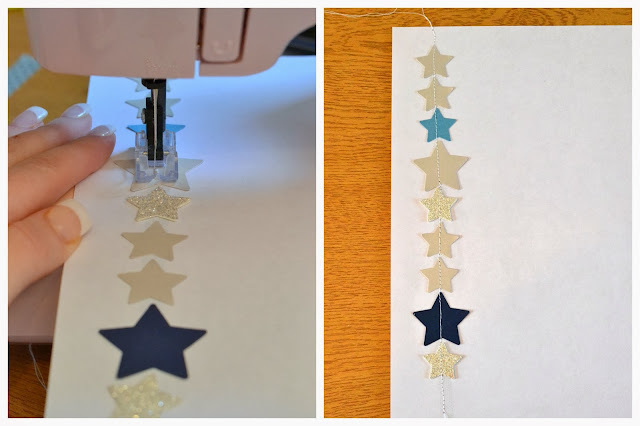 Once sewn, turn over the paper and tear away one side - the paper is effectively perforated by the sewing machine so this should be easy, and because the non-permanent adhesive was applied to the paper rather than to the stars, it should stay on the paper when you peel it away. Once one side is off, peel away the other side too. 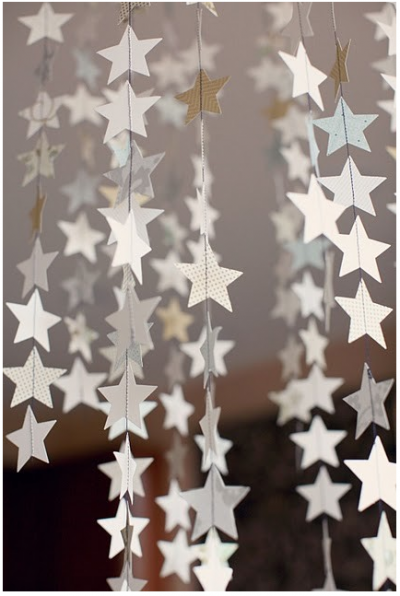 Small pieces of the copy paper might be left behind in some places - rub these off and you should be left with a perfect chain of stars. OK. Pretty huh? Make another 6 of these so you have 7 in total. I varied the order of my different stars and also made some short and some long. Next punch a a large scallop circle. Mine is 2 3/8ths" and has 14 notches. If you don't have a scallop punch then just cut out a circle of similar size and cut small notches with scissors. 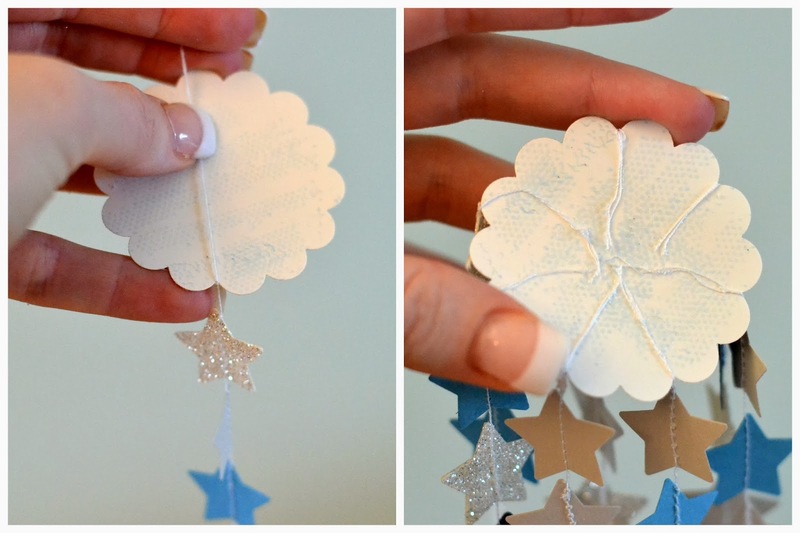 Apply adhesive all over one side of the circle and stick the ends of your star chains to it. Position them so they fall in-between the notches. My circle has 14 notches so I went with every other one. Once all 7 strands are in place, add a bit more adhesive and stick another scalloped circle on top to hide all the threads - you might need to trim the ends a bit. Finally, pierce a hole through the circle and thread a loop of bakers twine (or similar) through. Tie the ends in a small knot underneath. Trim the threads at the end of each star chain and voila, you are done. Hang from the ceiling. All finished and it looks pretty hanging from the ceiling and it's short enough that my tall husband won't get tangled up in it as he walks by! I hope you've enjoyed the tutorial, make sure you check back to the UKS home page tomorrow to see another fab project. How pretty - TFS such a lovely project. Lovely elegant project thanks for the tutorial. You have explained it really well. Very cleverly done! Pinterest is great for inspiration isn't. It? How clever of you to figure it out! That looks really good .. and your instructions are great, Thank You. Really nice project, thanks for the tutorial. That's so pretty, Niki. Thanks for sharing. how pretty and what a neat idea. Thanks for the explanation. So pretty, and so easy to make (once you've figured it out for us). I fancy one in traditional red, green and gold. Thank you for showing us how to do it. So pretty - great use for star punched scraps ... or hearts! Ooh lovely, thanks for tutorial. Love them, we will definitely be having some of these hanging about.